Createspace Independent Publishing Platform, 9781515372806, 326pp. Meet Julie Chavan. Julie's trying to rescue the legendary New York publishing house, WEST 57. Everyone else in her life is trying to rescue Julie. Her mother. Her ex-fianc . Her ex-best friend. Even the ghost of her dead father. They all think they know what Julie needs. Actually, what Julie needs is a big bestseller for WEST 57 - but her debut of the year's hottest book is spinning wildly out of control. Julie's dealing with a dead con artist, an over-sexed London agent, an irresistible young book editor, a drunk author spouting bawdy limericks, and a flying Chihuahua. The smart thing would be to say goodbye to WEST 57. Julie's Hollywood mother wants her in L.A., and there's nothing keeping Julie in New York - nothing except her whole life. But before Julie can decide where she's going, she has to decide what she really wants. 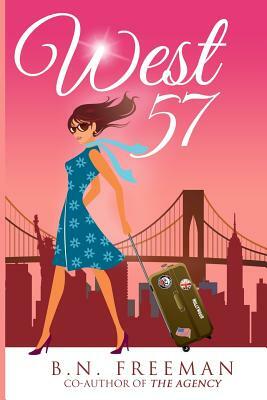 Exuberantly funny and emotionally rich, WEST 57 will make you laugh and cry about love, friendships, and the big choices in life. In addition to writing witty, romantic novels like WEST 57 and THE AGENCY, B.N. Freeman is well known to readers as bestselling thriller author Brian Freeman. His books include the popular Jonathan Stride and Cab Bolton series. Brian won the award for Best Hardcover Novel from the International Thriller Writers organization. Lisa Gardner calls him "a master of psychological suspense," and Michael Connelly says, "This guy can tell a story." Nelson DeMille calls him "a first-rate storyteller." His books are available around the world and in audio editions. Connect with Brian by e-mail at brian@bfreemanbooks.com or on Facebook at www.facebook.com/bfreemanfans or Twitter and Instagram using the handle bfreemanbooks. His web site is www.bfreemanbooks.com. For an inside look at the personal side of the book business, you can also like his wife Marcia's Facebook page: www.facebook.com/theauthorswife.